June Marie Eddleton, the daughter of the late Ida Gillan Eddleton and James Louis Eddleton, was born on June 29, 1934 in Elizabeth, New Jersey. 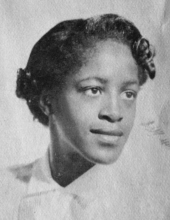 A lifelong resident of the borough of Roselle, June was the product of Roselle Public School system and a graduate from Abraham Clark High School. She retired from AT&T where she served as an Administrative Support Person for more than 30 years. June enjoyed traveling with her sisters, listening to Jazz and spending time with her family and friends. On Friday, March 22, 2019, June Marie Eddleton passed from labor to glory at the age of eighty-four. She was predeceased by her three sisters: Doris Eddleton, Florence Eddleton and Barbara Joseph; and one brother, James Eddleton. June leaves to cherish precious memories, her devoted caretakers: Kenya B. Eddleton and Gail Eddleton; one sister, Janet Bryant of East Orange, New Jersey; aunt, Bessy Hudley; and a host of nieces, nephews, cousins, dear relatives and friends. To send flowers or a remembrance gift to the family of June Marie Eddleton, please visit our Tribute Store. "Email Address" would like to share the life celebration of June Marie Eddleton. Click on the "link" to go to share a favorite memory or leave a condolence message for the family.